Kagura is a traditional performing art that's been preserved in Hiroshima since olden times. It has flourished recently, and can now be seen in various parts of the prefecture. Today we introduce An Evening of Kagura, a show with English subtitles. What Is Kagura, Japan's Traditional Performing Art? Hiroshima, known in Japan as the city of peace and culture, offers visitors numerous can't-miss sightseeing spots. On the list are the Peace Memorial Park, which includes the Atomic Bomb Dome and the Peace Memorial Museum, Miyajima, which is known for its superb views, the ORIZURU TOWER, a peace-themed multi-purpose tourism facility, and Hiroshima Castle and Shukkeien Garden, which both tell the history of Hiroshima. In addition to these famous sightseeing spots, you can go for a stroll through the lively city center and its many shopping spots, and you can also enjoy local food favorites such as okonomiyaki and oyster (kaki). Just by coming into contact with Hiroshima's daily life, you can have an enjoyable time experiencing the city's unique culture with all five of your senses. Though it offers Buddhist temples and Shinto shrines, impressive heritage sites, wonderful views, local delicacies, shopping, and just about anything you can imagine, Hiroshima sightseeing might still be lacking something. Perhaps... a direct experience with Japanese traditional culture? If it's traditional culture that you want to experience in Hiroshima, then we highly recommend a kagura performance. Kagura, which conveys a feeling of gratitude for nature's bounty, is a Japanese traditional performing art consisting of dance and music. It's often performed as a ceremony at Shinto shrines. 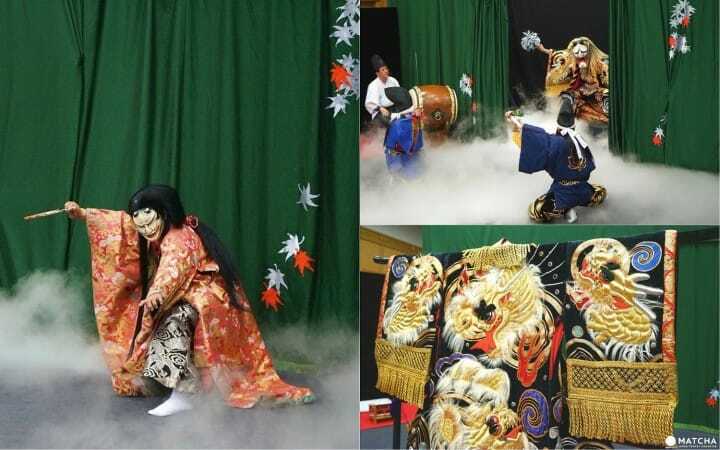 From olden times in Hiroshima prefecture, Shinto music and dance performances were held during the autumn harvest festivals, and even today this tradition lives on in the prefecture's northern towns of Akitakata city, Akiota-cho, and Kita Hiroshima-cho. In today's article we'll tell you about the attractive features of Hiroshima Kagura, and also introduce you to An Evening of Kagura, a kagura show including English commentary that can be seen in Hiroshima in 2019. What Exactly Is Hiroshima Kagura? When one mentions Hiroshima culture, what often comes to mind is Hiroshima kagura, which has been receiving world wide attention in recent years. Kagura, a traditional performing art boasting a history of several hundred years, enchants audiences with its elegant dancing, magnificent costumes, and stories based on legends that have been faithfully preserved in Japan since ancient times. Recently, Hiroshima kagura made an appearance in Paris for KENZO's 2018 Spring - Summer Collection show, and created a lively atmosphere with its unique visuals and rhythmic performances. Based on Japanese mythology and legends, stories are brought to life with energetic dance routines and powerful stage theatrics. The kagura shows are easy to follow and are performed right in front of the audience. These dramas feature heroes battling large snakes and conquering ogres and devils, show the fight between good and evil, and tell stories about times when divine gods walked on the surface of the earth. They are all performed vividly with highlight-filled stage direction. Even if you don't understand the language being spoken, you can still easily enjoy these simple performances. For visitors who have an interest in Japanese mythology and would like to get a taste of this mystical world without any inconvenience, you can watch a live kagura show complete with English commentary right here in Hiroshima! An Evening of Kagura - A Performance Including English Commentary! An Evening of Kagura, held every Saturday (only on May 12 and June 9 on Sunday) evening from 19:00 and particularly suitable for visitors to Hiroshima, is a series of Kagura performances with English commentary. Shows are staged in the Hiroshima Prefectural Art Museum (basement 1F auditorium) and the Hiroshima YMCA International Culture Hall. There will be 20 performances at each venue, resulting in a total of 40 stages. If you get to the auditorium about fifteen minutes before the show starts, you can get a close-up look at some of the gorgeous costumes and masks that are displayed on the building premises. In the same venue, we also recommend watching a complimentary video that helps to explain some of the traditions and unique features of Hiroshima Kagura. Just before the curtain rises, a commentary on the evening's program is given in English. During the actual show, a monitor beside the stage will have English subtitles, so it shouldn't be difficult at all to follow the storyline. After the show, there will be an opportunity for audience members to meet the stage performers in person, and they'll be able to ask questions about Kagura and also about the show itself. MATCHA staff members had the chance to see the highly publicized Hiroshima Kagura show (complete with English subtitles)! Today we bring you the full report on this show entitled Tsuchigumo, performed by the Asahigaoka Kagura Troupe on April 15, 2018. The Asahigaoka Kagura Troupe got its start in 1987 and is currently based in Hiroshima city's Asakita ward. This Kagura troupe consists of seventeen members, including eight university students who all share a love for Kagura. More than just simply a hobby or part-time job, performing Kagura is a life passion for members of this troupe. Despite their busy schedules with work, studies, and other commitments, they still manage to meet three times a week for training, and put on shows at shrines during festivals and also shows for the general public. Tsuchigumo, the show that we had the privilege of watching, portrays the legend of shogun Minamoto no Raiko (also known as Minamoto no Yorimitsu) who conquered the tsuchigumo (*1). *1 Tsuchigumo: (literally dirt spider) historically referred to bandits, rebels, and misfit clan leaders, but with the passing of time became established as yokai. Yokai are a special class of supernatural monsters, devils, and demons in Japanese folklore. During one time period in Japanese history, according to this legend which spread throughout the middle ages, vengeful spirits and ghosts become tsuchigumo, who settled in mountain caves and underground places and committed evil acts. The shogun Raiko, who at the time played an active role as a samurai, was already known as a hero. Raiko, who was suffering from an illness, received from his maid what he thought was medicine. However, a tsuchigumo, disguised as the maid, had actually tried to kill Raiko by giving him some poison. Despite being weak from his illness, Raiko uses every last bit of his strength to defend himself and eventually sends the tsuchigumo fleeing. Raiko's retainers follow in hot pursuit and using Raiko's heirloom sword (called Kumo-kiri, or spider-cutter) finally defeat the demon. Now let's watch Asahigaoka Troupe's Kagura performance entitled Tsuchigumo. First up on stage is a musical ensemble called kagurabayashi. The music for this kagura show starts with four instruments: a large taiko drum, small taiko drum, cymbals (chochigane), and a flute. Once the show begins, it soon becomes apparent just how important a role the music's rhythm plays in Kagura's dance routines. Appearing on stage next is a tsuchigumo disguised as Minamoto no Raiko's maid. After the tsuchigumo passes the poison-filled medicine to Raiko, the tsuchigumo's power increases and its face starts looking like a demon. With lightning speed, the stage actor has put on a new mask while standing right in front of the audience! This is an exciting, heart-stopping drama filled with amazing acrobatics occurring one after the other. The story's plot steadily speeds up and heads for the climax, a final showdown between Raiko's retainers and the much reviled tsuchigumo. Completely entangled in the tsuchigumo's spider thread, what will become of our two heroes?! At the end of the fierce battle, the retainers slash the tsuchigumo using the heirloom sword (Kumo-kiri, spider-cutter) they received from Raiko. Coughing up its blood-covered thread, the tsuchigumo collapses to the ground and shortly thereafter, disappears. In the end, the two heroes perform a victory dance while expressing their jubilance and joy. Without a moment's notice while their bodies are spinning, they do a quick costume change into a colorful and magnificent outfit! Right up until the very end, this stage performance overflows with delightful surprises, and the audience can't help but want to give the actors a warm send-off with a huge round of applause. Meet All the Performers Backstage After the Show! After the show is over, audience members can ask the troupe members some questions, and can also try on the outfits and masks and get their pictures taken. Don't miss out on this rare and special opportunity! If you try on the outfits you'll no doubt be surprised by their weight. Hats off to the troupe members who danced the Kagura so beautifully, despite wearing costumes that weigh as much as twenty kilograms! Right near the entrance to the auditorium is Kaguraden, a shop where you can purchase Hiroshima Kagura goods. Everything from tasteful T-shirts and tote bags, clear folder files and other interesting stationery goods, all the way up to iPhone cases - there's a full selection of merchandise so you'll have no problems finding the ideal souvenir to commemorate your experience. See Kagura During Your Hiroshima Sightseeing Trip! An Evening of Kagura, which is held in the basement auditorium of the Hiroshima Prefectural Art Museum and at the Hiroshima YMCA International Culture Hall, is perfect for those who'd like to experience Hiroshima Kagura. Shows run every Saturday (only on May 12 and June 9 on Sunday) from 19:00 in the evening. Occasionally, shows are not offered on some Saturdays and Sundays, and are sometimes held on Mondays and other days of the week, so for details please refer to the official An Evening of Kagura Homepage. In Hiroshima prefecture, you can watch shows put on by active Kagura troupes and performances usually run for forty-five minutes. For interested parties, please feel free to join the picture taking and other post-show festivities to your heart's satisfaction. The show commentary and subtitles are all in English, and afterwards, if you'd like to chat with the troupe members, an interpreter will be available. Every Wednesday at 19:00 at the Hiroshima Prefectural Citizen's Culture Center, two Hiroshima Kagura shows are run as regular performances. (*Please note that these shows are for the general public. As a result, English subtitles won't be available, however, show notes in English will be distributed). Also, for those who would like to see a Kagura show held in nature, held at an actual kagura hall (in a shrine), or in a large venue, we recommend heading to the north part of Hiroshima prefecture. In Akitakata, just one hour north of Hiroshima city, you can take in a performance. Here at Kagura Monzen Tojimura Village (Japanese), a Kagura theme park, you can enjoy watching shows throughout the year. So on your next sightseeing trip to Hiroshima, please experience Kagura, one of Japan's traditional arts. You'll be enchanted and get carried away by the beauty and freshness of the performances. Fixed holidays Mondays, year-end / new-year December 26-January 1. Exceptions are national holidays, substitute holidays that fall on a Monday, and during special exhibits. Access 10 minutes by taxi from JR Hiroshima Station. Hiroshima Area Guide - All You Need To Know Before You Go! Make The Most Of Your Hiroshima Trip With This 3-Day Itinerary!